In the past Quakers must have seemed particularly rude and offensive. The usual protocol associated with fashion, was dropped, so it gave the impression we did not care for the values of society or what other people thought of us. Instead of addressing people in an acceptable manner, we "Thee'd and Thou'd" them regardless of social status as if was considered a priority to consider ourselves every bit as good as the best. Instead of allowing preachers to guide their parishioners in the customary manner, Quakers would frequently interrupt church sermons, shout the minister down and encourage a somewhat unruly debate. This must have been particularly annoying for those who had come to hear the thoughts of an educated man and worship. Quaker refusal to confrom even to the King's authority through subscribing to an Act of Allegiance, must have seemed not only scandalously rude but also tantamount to rebellion. This extremely dangerous, blatant defiance for what was generally seen as a calming and controlling influence, could not have come at a worse time. For those of an older generation who had lived through the turmoil of civil war and the aftermath, it must have seemed that this arrogant ill-informed group was being stirred up by malicious itinerent preachers to renew all their troubles. Those of us familiar with the work of Thomas Ellwood may appreciate the strength of a young man's conviction, when he refused to take off his hat in his father's presence. This act of defiance would have been particularly shocking to his father Walter since it was customary at the time for children to show their parents considerable deference. His distraught father's expectation had been entirely reasonable, more liberal than most since it was usual for children address parents kneeling. Such custums were particularly important because the breakdown of families through divided loyalties during civil war and its aftermath had quite probably troubled people the most. How terrible it must have been for a father to confront his own sons in battle, or a daughter lost to her parental family through her husband's political allegiance! Through the strength of people's convictions, these very tragic situations had happened often. There had evidently been great danger in the holding of strong opinions and for those wishing to restore and maintain peace, the strength, structure and survival of family life was now of paramount importance. As Thomas Ellwood became increasingly clever and crafty in his defiance, associated with company of his own choosing, desperately seeking guidance from people he could respect, it is possible to imagine a father's pain, reviewing the relationship he had built up with his son over the years and wondering like so many parents still do "Where did I go wrong?" The Ellwood family home was at Crowell in Oxfordshire. Thomas Ellwood's father had a small estate which he hoped to pass down, a family and household to protect. Instead of remaining in so dangerous a location, Walter Ellwood moved his family to London. Perhaps it was understandable that so many decisions taken during his son's formulative years were influenced heavily through fear and the very limited number of choices. At the onset of war Walter Ellwood had been in a very difficult position. As a rural squire and local magistrate, his role and status in society was derived from the King and yet he knew of huge injustices in society from that same authority which also threatened to undermine his faith. When Charles I's commission of array had been read out at the town of Watlington close by, summoning his tenants to arms, instead of following the king's command, he could well have been one of a number of local landowners who had chosen to stay away. Through this sudden withdrawal of support, messengers of the King were left isolated and so it was possible and capture and imprison them. Confronted by his son's rebellion, a distraught father recognised how it is possible to be led an alternative allegiance and that those qualities associated with honesty which had created such risk and unhappiness to his own generation they shared. Crowell had been a particularly dangerous location, close enough to the royalist headquarters at Oxford for regular pillaging. Since the practice of forced billeting was common, enemy soldiers would have been frequently living in his home. Besides these regular hazards there were a considerable number of skirmishes and several small battles taking place close by. Like many soldiers and civilians, Thomas Ellwood's father may have felt sure of his allegiance at the onset of war but regular repeated danger, the practical demands of his own side and the pragmatic shifting of intent to gain additional allies can so easily undermine you. Although our society may not be at war, there are still many dangers. Instead of royalist raiding parties, we have the challenge of defining priorities and then sticking to them. For most families, the media is now very firmly billeted in our homes. Within any neighbourhood there are skirmishes in the struggle for resources and power. We see the casualties of an unjust society about our home and community. So many of us hold on to our estates though fear, keep the shutters very firmly closed and refuse to tend the wounded. Perhaps like many civilans at that time, we still slink off to the battlefield once all action has died down to strip the wounded of clothing and possessions because we believe our primary purpose is to emerge through life with some kind of trophy. Do we sometimes wonder with our own children, "Where did we all go wrong?" As Thomas Ellwood slipped out of the house once again to be in the company of Quakers, he left not only an empty room but other members of his family, servants who relied upon the estate for a livelihood and a role in the community which at the oldest surviving son, he was supposed to one day inherit from his father. Traditionally Quakers would seem to have a problem with continuity and leaving a bit of a mess behind them. This family estate, like our own had already been decimated by war. Perhaps in the silence of his own home a bereft father came to understand a little more about leadership. He had wished so much to be a leader for his son, command his respect and yet the only thing which had been necessary for him to do was be an example, a pattern for him to follow. During the English Civil War as in the rest of life, the best leaders are those who are able to communicate their knowledge of being led. In desperately hard and troubled times there had been a leader even above the King that he could follow. The way Quakers talk about God can seem very mystifying. There are an increasing number claiming to be non-theists. Some are "open-minded about the possibility," whilst a considerable number are more pro-active, describing themselves as seeking. It is not unusual for those at our Meeting to to call themselves names such as "Humanist-Quakers" just as our surnames have tendency to become double-barrelled! At times Quakers talk in quite an alarming way about the " evidence for some Higher Being" as if this higher being should be placed at an only slightly higher level to themselves. When I first came to Meeting it was disconcerting to hear so much talk about "The Light." At the time I was having considerable problems with my eyes due to light-sensitivity so light could be quite painful. There were also power-cuts so we had candles at hand for times when lights would quite unexpectedly go out. It seemed even then that the terms Quakers use to describe God could be misleading. Quakers sometimes speak of "being held in the Light" This still reminds me of a cat basking on a window-sill which must be a very relaxing, warm and comfortable experience. There would seem enough evidence to suggest however that God does not require us to have a relaxing, warm, comfortable experience all the time. A cure for seasonal affective disorder, perhaps all forms of depression only goes a very small part of the way if we are going to be honest about God. Light however should not be underestimated. It has many attributes. Besides providing warmth, light also allows us to grow, so no wonder Quakers are always changing and modifying their belief. To me the process of shedding light on a matter is of particular importance. It would seem we have been given our intellect and abilities for a reason. There should be no conflict between our minds and our faith. Like the Old Testament prophet Jacob, we are supposed to wrestle with angels because through the struggle to discover truth, our awareness of God's power will grow. Quakers seem very good at finding short cuts.We use the terms "Love" and "Peace" a lot to describe God. Although unquestionably attributes of God these observations should not detract from an understanding that love and the ability to work for peace should be our attributes too. At times it may be very helpful to look at the practices of other faiths. For example, the Muslim rosary has 99 beads, one for each name of Allah as found in the Koran. This aid to prayer is called the subha, meaning "to exalt. I find the names of Allah very beautiful so will put in a link for you to also be inspired by. It is reassuring to me that throughout the Old Testament no one has ever been expected to understand God. When Moses enquired he was told simply that "I am who I am." It was expected simply that mankind should to do the will of God, conveyed for the safety and well-being of mankind through the Ten Commandments. From whatever our starting point it would seem to me that the search for God begins with a proper understanding of ourselves, a process that involves honestly, humility, a sense of wonder, and then listening out for God. One of the first questions people ask me when they know I am Quaker is whether or not Quakers believe in God. If we do this makes us technically a religion and our meetings quite genuinely for worship. If we do not believe in God this would make us in the eyes of other faith groups deficient in some way, more like a shared interest, lobbying, lifestyle or discussion group, a clear break with tradition, and with nothing clearly identifiable to worship. Lately, through a wish to be inclusive, there has been a growing emphasis upon the needs of "Non-Theist Friends" in our Meetings. Since our Meetings are intended for all people at every stage of their spiritual journey, there is bound to be some variation. A strong emphasis upon honestly inevitably makes us much more open when it comes to expressing doubt. Since we aim to avoid hierarchies in a Meeting, there is now very little distinction between "Seekers after Truth" and Friends who have been "Convinced of the Truth" as there has been in the past. It is not at unusual for Quakers to move in both directions between these stages at various times in their lives. We have Attenders who have been coming and contributing to a Meeting for decades besides those who will stand up during their first visit to happily declare an insight that you had never previously considered and that they have found their spiritual home! In a Quaker meeting it is accepted that every starting point is different and that everyone has something to offer. This challenge to accommodate so many different views of God need not necessarily drive us apart. It reminds me of a shop in our village which began by selling meat, then decided to stock frozen fish. When it began selling fruit and vegetables, I noticed a very convenient hook outside that might do for a lead, which made it an ideal dog-walking destination. Each time we visited my dog would look sadly at her owner since all the other customers came out with very interesting carrier bags whereas hers had so obviously missed to point of a butchers! At some point the shop gained an opportunity to market locally produced jam, and for a similar reason shortly afterwards it gained a stock of herbs. Although it is extremely important that all these items are recognised for what they are and stored in the most appropriate location, our village shop is the ideal place to go if you wish to cook a meal from scratch. Some of the merchandise I wouldn't think to buy for myself. There are certain vegetables I have no idea how to prepare, brutally honest areas of the meat counter and little faces peering sadly out of the fish freezer which to my mind look a little scary! In coping with my local shop, I have to accept that the food I consciously choose to avoid might be absolutely ideal for someone else. Likewise I think that it would be very sad if the meat-eaters in my community made an arbitrary decision to ban vegetables. There are just so many different recipes about and every starting point is different. Just as my local shop is a very good place for those who wish to plan a meal from scratch, it would seem to me that a Quaker Meeting is a very good place for those wishing to use unprocessed ingredients for religion. Our strong emphasis upon truth allows for strong foundations, and since there is no creed we are not going to coerce or exclude an honest enquirer through unrealistic expectations. Although there are so many different ways to sit in a room in silence, we provide a defining and crucial opportunity to worship. For those Quakers who may feel threatened or undermined by the presence of different views within their Meeting, I think it is important to accept that the only person we can control in this issue is ourselves. We have a choice on how to express both our beliefs and our non-beliefs in Meeting. There is the option of being friendly, and one of being proud in our own convictions, cold and unwelcoming to others. Traditionally we only aim to be patterns, not persuaders. Those times when I struggle to accommodate non-theist ministry in Meeting, I now try to ask myself, "What sort of Quaker are you?" For some it is assumed that the search for God begins with knowledge. The cleverer we are, the more we read, reason and use our imagination, the more likely we are to find him. To me this does not seem very fair, since it would imply an exclusive arrangement and that clever imaginative people who have plenty of time to read books are at a very definite advantage when it comes to finding God. There is also the problem of pride. At times there is a temptation to celebrate our learning, share it with other people thinking we are providing a very useful service to humanity as a whole being one step ahead of the rest. We may consider ourselves very fortunate to have worked it all out, cracked the code, tell everyone about our highly intellectual hieroglyphics, and build a pyramid all of our own in Meeting. Then there will be the doubts, times when our perception of God looks far too much like ourselves, a case of mistaken identity, so there is a need for bravery and honesty as we head back out into the wilderness again as Seekers after Truth. That time of solitude may not necessarily be in a Meeting for Worship although I think it may be helpful to remember that we are called Quakers for a reason. Like Moses our worship is focused on a time of solitude. We see ourselves for what we really are, and listen out for God. When we discover a sense of wonder at the majesty of God, no wonder we have a reputation for quaking in our shoes like Moses! Moses first encountered God in the wilderness when a bush quite unexpectedly bust into flames. These days, if such an event happened we would call it spontaneous combustion, look for a scientific cause, perhaps set fire to a few bushes of our own as an experiment to prove the point, not really considering where all this ingenuity, collective knowledge and incendary ability might originally have come from! Generally the first thing people do when they encounter a fire that no one's planned, is act quickly, make safety the first consideration and then do everything possible to put it out. Instead Moses waited, looked on at the beauty of the flames, and allowed himself that opportunity to experience wonder. How did Moses know that this was God? Well, I think he realised this was the case because it changed him. The bush was perfectly OK, despite having been burning for some time. Since bushes don't usually talk, it had no way how telling other bushes quite what it had been through which must have been a bit frustrating. This was nothing however to the predicament of poor Moses. He may have been a little scared before this had all happened but must have been absolutely terrified now. Instead of allowing himself an opportunity to hide in the wilderness for the rest of his life, he knew now that it was necessary to be honest about his true identity, face up to his past and go back to the court of Pharoah. How do we know that it is God speaking to us in our Meeting? Perhaps in the same way as Moses, that we are transformed. We emerge honest about our true identity, facing up to our past, ready to say we are sorry. For the challenges we face in a very secular, materialistic and so often uncaring world, we go back to the court of Pharaoh. During the last few years it has become relatively Common for Quakers in the UK to describe themselves as actively seeking God. Although every need, starting point, perspective and insight will be different, through this blog I have an opportunity to share things that have been helpful to me. One of my favourite characters from the Bible is that of Moses. Despite having lived thousands of years ago, Moses seems to me a character we might so easily recognise today. This young man had been brought up with everything but the truth. Through his adopted parents and the influence of Egyptian culture he might easily have over-estimated his importance, the certainty of a life surrounded by possessions in the next world and even believed he was a God. Perhaps Quakers also have a tendency to hang out in Pharoah's court. We talk somewhat vaguely of having "that of God within us" and in a rather smug manner have from our earliest times regularly described ourselves as being "The Children of God." These sources of self flattery may have been to the detriment of every other faith, and a considerable source of annoyance to others, but it is possible to become very attached to a sense of group identity that seems to work so well. Those adopted parents will look at you adoringly, provide few guidelines and uncritically accept almost everything you do. Through the distractions and priorities of our secular court, and puffed up by the pride of our own intellect, we build our own pyramids, storing up our culture, traditions and possessions as if they will be of relevance and use to us for ever. As Moses discovered, the main casualty of spending far too long in Pharoah's court is truth. Although privilege, opportunity and a particularly narrow escape involving a wicker basket, might be seen as an advantage, so far this had not been the case for Moses. Instead of growing up into a helpful and responsible adult, he still had no understanding of other peoples' lives and lacked self-control. When confronted by injustice he did the first thing which came to mind, killed a man, and so proved himself to be of no particular use. At times Quakers will express a need to intervene, express their views in the most forceful manner possible, whether or not they understand a situation, appreciate the many different perspectives, or will be of any use. Perhaps like Moses, aspiring gods over-estimate the importance of power to resolve a conflict, like to do something none the less, and think it particularly important to be seen. In the wilderness Moses almost certainly realised that it was possible to go back. A royal prince could after all do anything he liked in Pharoah's court. His adopted family would focus on the good bits, adopt an editorial approach to his recent killing, and of course forgive him. There would be a life of luxury again. No one would ask questions, no one would question his character or judgement. From now on instead of witnessing the life of Jewish slaves he was forewarned, knew this might prove upsetting and so could choose his company with care. Instead Moses chose to remain in the wilderness, undertaking a very different kind of journey. Without status, possessions, or an adoring royal court it was possible to feel very small. There was no one else about to say that ignorance and killing another human being didn't matter. Through being thirsty, hungry, and unable to stop the beating sun, Moses gradually came to realise that he was not an everlasting god but human. Those times of living in the wilderness, even at our local Quaker Meeting can be particularly hard and lonely. Most of us would undoubtedly prefer to live a life of comfort in Pharaoh's court, happily endorsing all those cultural practices which so conveniently make us seem so very Quaker. Our spiritual journey might so easily stop with the bring and share lunch, the company of those who seem very like you or even at the cake stall. Our way forward might so easily involve making a judgement, perhaps even a rash judgement which we later recognise to be wrong. This spiritual journey begins a knowledge of being human. Through suffering, injustice and a full appreciation of our own ignorance, we gain an opportunity to learn. How not to offend my Muslim Friend about Quakers? Some time ago I was talking to a Muslim friend who asked me what Quakers believed in. I answered firstly with an approach that might be shared by a politician whose party has not managed to fulfil the promises of its manifesto with "Well we are all ever so diverse....". Since this did not seem a very helpful theological concept I then trotted out the usual explanation that "Quakers believe there is that of God in everyone." I might then have gone on to say that this belief makes us all ever such nice people so we have testimonies, everybody likes us, we did some amazing things in the past like fight slavery and that lady on the English five pound note with the funny hat on just happened to be a Quaker. Instead however I was stopped in my tracks because he was looking at me in horror. "That's terrible!" he said. "How can you possibly believe this! Such pride! such blasphemy! How can Quakers possibly believe that it is possible for Allah to be chopped up into tiny pieces and then divided out among you?" From these beginnings it probably goes without saying that I found it extremely hard to say anything very positive or convincing about Quakers. I went away feeling humbled. It seemed a terrible and demeaning thing that we should possess a theology that did not stand up to scrutiny from other faiths. One of the very good things about being a Quaker is that it allows you to go away and think so for the rest of that day I found a quiet spot where it might be possible to resolve this dilemma. This process might seem comparable to puzzling over the clue of a crossword puzzle and open to all faiths, although for me it seems to go much deeper. I need to put my own ego and intellect on a back-burner, stop talking and wait to be told the answer. At first the main thought on my mind was regret, that this process of thinking things over carefully and being open to the Spirit was taking place after I had given my reply. Sometimes however it is necessary to be humbled, and greater help to be shocked into action. It seemed to me that we have to be very careful about the way we describe our faith to others and this process needs to be begin by having sufficient clarity within ourselves. The answer I discovered to this dilemma speaks for me, I do not intend to speak for all other Quakers who will have their own insights, but as it has been so helpful for me, it seems like a good idea to share it. To me there is an important distinction to be made. There is God, who is absolute, all powerful, just, loving, forgiving and every bit as my Muslim friend perceives Allah through his own spiritual pathway. Then, as a quite separate entity, there is the "Kingdom of God" as taught by Jesus which may be no larger than a mustard seed, but for a Quaker there is no doubt that this capacity to love is within us. Perhaps through this belief we are more tenacious than we might be, considering every human being precious in the eyes of God, even when it seems all other hope is lost. Through choosing to be on God's side it is our joy and responsibility to strengthen and extend the Kingdom of God by allowing that capacity for love within us to grow. I never found an opportunity to speak to my Muslim friend again on this subject. Perhaps he still would not approve of Quakers. It has however been been a joy sharing my understanding with you now. I am full of respect for my Muslim friend, so grateful for the opportunity he gave me and wherever he is right now, quite certain that love can reach him. The time I was a rebel. Yesterday I was told a story by a very elderly relation which seems appropriate to share with you. When my aunt was about eight years old she came downstairs on Sunday morning and made the shocking announcement to her very God-fearing family that she would not be going to church that day. Imagine her surprise when her father replied, "That's a very good idea! Shall we go for a walk together?" 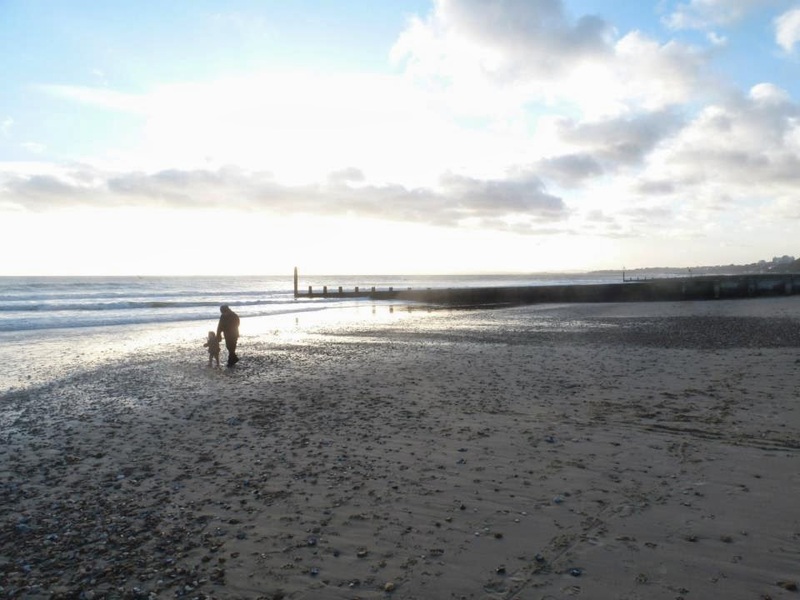 It was a very beautiful clear crisp morning on the North Kent beaches. There was a footpath leading out towards the sea which was possible over the sands if you took great care and had a guide prepared to hold your hand and come with you. Ninety years later and now almost entirely blind, that walk could still be recalled precisely. For a whole morning she had been alone with her father. Even now she could still experience what it felt like and knew that she was loved. I do not know how long my aunt remained a rebel. It may have been for only a morning. She has been to church for as long as I have known her. It would seem to me that human beings have three basic requirements before they are able to do or learn anything new. To me is the first requirement and fundamental to survival. When talking or writing about religion it is very important to recognise an individual's integrity and space. We all have our own perspective and every starting point is different. For this reason I do not find it very helpful to be preached at. It seems to me that when people do this they are assuming some kind of moral or intellectual superiority which however well intentioned, I personally find quite threatening. In turn it would seem most unreasonable and unkind if I tried to inflict this preaching strategy upon others. Instead it would seem my responsibility is to do things as they seem right to me, to be merely a pattern as originally suggested to Quakers. At times I may lapse but the intention here is to avoid some hefty manufacturing process that identifies a desired end-product and then stamps on it an opinion. The reason I am writing the blog is because I care about you the reader. I also care about Quakerisim, the legacy we have inherited from the past and how it relates to the world around us today. Quakers sometimes talk of how our testimonies are changing but I wonder if we should ever believe ourselves to be entitled to forget them. There are times when Quakerism frustrates me, when being in a Quaker Meeting can feel very lonely and so different from the experience of being surrounded by Friends. It seems to me that there is much confusion about our historic Christian identity, and through a wish to be inclusive, a well-intentioned growing secularisation in our Meetings which concerns me. These days we do not seem to distinguish between a Seeker after Truth and those who talk of having been convinced by the Light and Love of God. Should there be more leadership among Quakers because I wonder if the Society of Friends has a future if it does not seem to mind in which way it is heading. To me that responsibility of being inclusive is not about adapting to your surroundings so as to fit in with everyone else. In the past Quakers were prepared to stand out, at times very uncomfortably in society. It was I believe this quality of integrity and loyalty to their convictions which made them trustworthy. Everyone knew where they stood so it was possible to communicate, establish understanding and feel very safe with a Quaker. The Quakerisim we have inherited from the past was built upon a shared insight, loyalty to the truth and love among Friends. These days we may not have that same shared insight. Many Quakers do not even attempt to understand the ministry of early Friends. At times I am ashamed because these Early Friends were prepared to go for prison for their beliefs, some banished and others even died. It seems that we have let them down, betrayed them, so much of our past is lost. In all our changes I believe there is hope because there is still love among Friends. For the future there may be a challenge to re-trace our steps, whilst the things we are prepared to do for love will still be the most important things we do. Beginning this blog was a very big decision and so I have decided to see it firstly as my undertaking for Lent. Quakers have a testimony about truth and openness so it is possible you may feel I should be open, making my identity known, trusting the Spirit to help me. Perhaps I should explain. To me being a personality could be a distraction from what I am trying to say. I wish to focus upon the truth as I see it and am not so brave as to be able to carry my opinions publicly and often with everyone I meet. At times I am stopped in my tracks through writer's block, do not possess the confidence perhaps that I should and it would be a disappointment to encounter a discussion group each time I attend my local Meeting for Worship. At times I will express concern about the Society of Friends, our priorities, the way we act, communicate our beliefs and our contribution to the world. We do not get things right all the time, and although there is some difference between us and other religious groups, I believe all religions are designed to make us better at being human. For me discovering an opportunity to write secretly was like finding some item of clothing in an old suitcase at the start of a new season. Then quite unexpectedly it fits you. You travel lighter when it is no longer necessary to worry about who you are. Since beauty rests in the eye of the beholder, I shall do my best to communicate the truth as I see it, then leave it up to the reader to decide whether or it speaks to their condition, fulfils a need or even qualifies as fashion !